A large explosion late Tuesday at a wedding party for relatives of a Fatah leader injured at least 50 people in Gaza, Palestinian medical sources said. Fatah leader Mohammed Dahlan, the uncle of the groom, did not attend the wedding, according to witnesses. The cause of the explosion, which occurred at 11:10 p.m. in Khan Younis, was not known. Dahlan is the Palestinian Authority’s national security adviser. Details of Tuesday’s explosion were not immediately clear. Dahlan’s associates in recent years have been targeted by Hamas as tensions between the militant group and rival Fatah — the Palestine Liberation Organization’s largest faction — escalated. 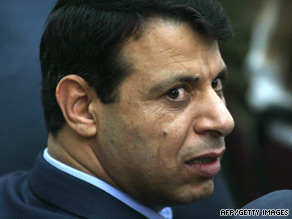 In January 2007, Hamas gunmen tried to kill Dahlan’s bodyguard. Dahlan was not present at the time of the attack. In that month alone, Fatah and Hamas militants abducted more than 50 members of their rival groups — most of them in the West Bank town of Nablus — according to Palestinian security sources. Dahlan’s nephew was kidnapped the next month amid a fragile cease-fire between supporters of Hamas and Fatah. In late December 2006, Hamas accused Dahlan of orchestrating an assassination attempt on its leader Ismail Haniya. Haniya’s son was injured in the attack. Dahlan has described himself to CNN in the past as being involved in directing Fatah’s military response to Hamas’ military “provocation.” Dahlan is particularly disliked by Hamas because during his leadership of the Preventive Security Forces in the 1990s, Hamas members were apprehended and tortured. After a series of suicide bombings in Israel in 1996, Dahlan took a major part in the Palestinian Authority’s effort to crack down on Hamas.